He played way out on Court 14 Friday, with the Centre Court stadium still in view, hovering. With only three rows of stands, people were packed around the brick walls just six paces off the side of the court. People were on their toes, or kid on dad’s shoulders. Some people stood and strained from the seats from the next court over, others climbed the walls until security told them to move. Then more climbed anyway. Dustin Brown became a cult figure at Wimbledon this week. Tall, black, Jamaican/German with sleeveless shirt, stretched skinny muscles, long dreads down his back and a jacket promoting his Twitter handle on the back: @DreddyTennis. He gained 15,000 Twitter followers this week. Usually, in the minors, he said, he gains three. Not 3,000. Maybe for the first time, this was the week of the little guy, the no-name, the underdog at Wimbledon. Well, that’s not exactly right. It was their week on the Wimbledon grounds, the outer courts. That’s where they were heroes, with the people who had the cheaper, outer-court tickets. This isn’t just a tribute to some journeymen having the week of their lives. It’s more of a cultural thing for this place and this tournament. 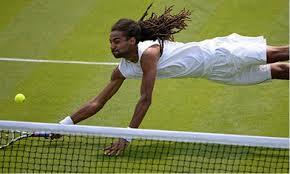 Be honest: With Wimbledon’s history, you would not expect a black Jamaican with long dreads to actually become the cult figure. 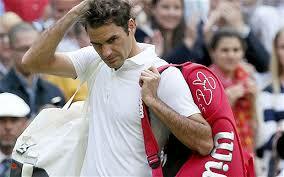 At this point, Roger Federer is just too stubborn. I get it. I understand. You do something a certain way, and every day for nearly a decade, that way recites back to you: You’re the best ever. You’re the best ever. But the Federer era ended Wednesday. After reaching the quarterfinals or better in 36 consecutive majors spanning nine years, he lost in the second round at Wimbledon on Wednesday to Sergiy Stakhovsky, 6-7, 7-6, 7-5, 7-6. I’m not sure that’s really Roger Federer anymore. Looks like him, but it’s not.